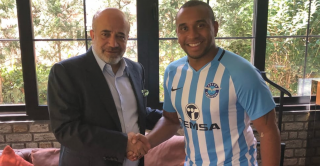 Former Manchester United midfielder Anderson, who spent almost a decade at Old Trafford, has joined Turkish First League side Adana Demirspor on a three-year deal, the club announced today. Anderson made 181 appearances for United between 2007-2015 and has since gone down as a cult figure at the club. He was welcomed in the south of Turkey by Adana Demirspor chairman Murat Sancak, it said in a statement. The First League is the second tier of Turkish football after the Super League. They finished in 12th place last season and will be hoping Anderson, a Champions League winner, can make the difference and help them gain promotion this season. Anderson joined United from Porto in the summer of 2007 and was seen as a player with huge potential. As well as the Champions League triumph in 2008 with United, Anderson won four Premier League titles. He also claimed the Golden Boy award for the best young player on the planet that year. He struggled with consistency under Sir Alex Ferguson, but the gaffer always had a soft spot for the Brazilian. David Moyes then sent Anderson on loan to Fiorentina after replacing Fergie in 2014 and his time at United came to an end shortly after Louis van Gaal took charge. After United, Anderson had a stint with Brazil side Internacional and also played for Coritiba on loan. It’s not a dream it’s real !! !